I made my first pan of biscuits when I was 9 years old. If there had been enough of them, all I would have needed was the mortar, and I could have built a sturdy house! Having unknowingly used plain flour and no baking powder, I cried when they came from the oven as hard as bricks. I never made that mistake again. As a Southerner and having been resident chef at every home I ever lived in, since I was a kid, I have striven to make the perfect biscuit. Not those dainty, smattering of jelly, hold with your pinkie in the air, city biscuits. But a biscuit that just screams to be smothered in gravy or stuffed with eggs and sausage. Every time I heard or read a new "secret" I was off to the kitchen to give it a whirl. 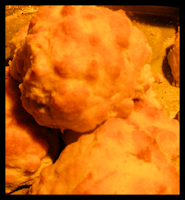 Aside from that first batch, my biscuits have always been great and get lots of compliments. But I have always felt there had to be an easier way. A way that would allow even the most insecure cook to create a dish to be proud of. I feel so bad when someone tells me that he/she can't cook, and I just don't think it's true. There's more than one way to skin a cat and some folks just need a different way to do things. So I love taking standard recipes and tweaking them to make them easier. 1/4 Cup Butter, margarine, shortening, whatever you have on hand. I Can't Believe It's Not Butter works great as well. Preheat oven to 375 F. Prepare your baking sheet by covering with a sheet of parchment paper or lightly greasing it with butter or shortening. 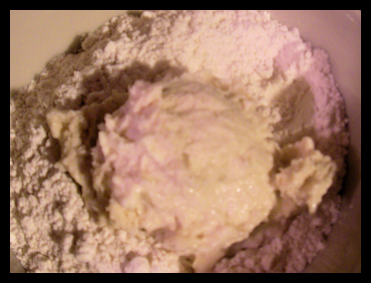 Place the 2 cups of flour into a medium size bowl. 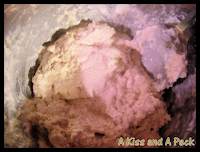 Add the butter and cut into the flour with a pastry blender, or break up with your hand, ever how you usually do it. 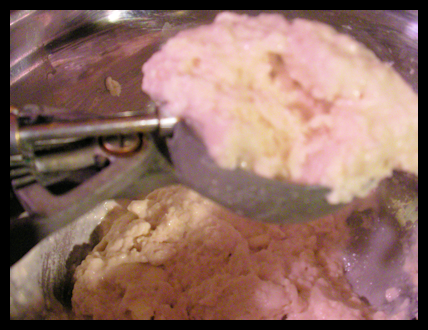 Continue till the margarine is the size of peas to marbles and distributed through the flour. Now add 1 Cup of the milk and mix with a spoon. You want a wet dough. A dough that you wouldn't dare stick your hands in. If it doesn't look wet, add the other 1/4 cup of milk. Now, take that other cup of flour and put it into a small bowl. With an ice cream scoop, dipped in flour to prevent sticking, remove one scoop of dough from the bowl and drop into the little bowl of flour. Put in the oven and bake for 20-25 minutes, or until they are a deep golden brown. You'll know when they look like you want them. Brush with butter when you take them out and enjoy! No fancy editing, This pic just turned out beautifully golden, as if on cue. LOL I think it must be the difference in lighting, from my counter to my stove top. These are even better made with buttermilk. But you can also use cream or canned milk. If you don't have an ugly, beaten, battered, 400 year old ice cream scoop like mine, you can use a plastic measuring cup, or whatever. Just sort of shape into a ball as you coat the dough in the flour. Save the leftover coating flour for your next batch or use it in the gravy. This recipe makes about 7 cat head sized biscuits. You'll get twice as many if you make regular sized ones. I usually double this recipe and I have a houseful to feed. 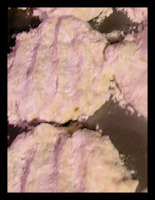 If there is a dusting of white flour anywhere on the biscuits after baking, just dust it off and carry on. This is complete normal and doesn't hurt a thing. I'm like a culinary Evil Knievel. I will take chances. Therefore, If I'm already baking part of the meal, and it's cooking anywhere from 350F to 450F, I will go ahead and put my biscuits in the oven along with it. I just watch them and I have never had them turn out badly.